Unklarheiten bezüglich der Buchung? Booking related Questions? - euromodelexpos Webseite! Unklarheiten bezüglich der Buchung? Booking related Questions? Sollten ihr unsicher sein, ob mit eurer Buchung alles geklappt hat, weil eventuell Bestätigungsmails euch nicht erreicht haben, dann könnt ihr uns bis zum 20. März dienstags, donnerstags sowie samstags von 17:00 bis 20:30 Uhr unter der Null Eins Sieben Zwei/1091648 erreichen. Oder ihr schickt über den FaceBook Messenger an Berthold Tacke eine Nachricht. If you're unsure whether your booking was successful because confirmation emails may not have reached you, you can reach us at 0049/one seven two/1091648 on Tuesdays, Thursdays and Saturdays from 17:00 to 20:30 until 20 March. Or send a message to Berthold Tacke via FaceBook Messenger. Wir möchten alle Aussteller bitten: Bringt gute Laune mit! Help to make the exhibition a success! 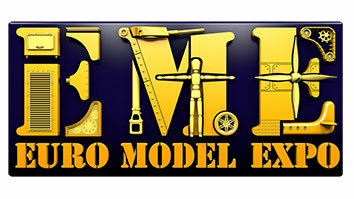 Support each other in the best model building camaraderie possible! Please let all visitors participate in your expertise! On 30th and 31st March 2019 in Lingen we are the ambassadors of this great hobby. Ihr findet die online-Flyer auf der Startseite oder hier zum Download. You find Download material on our landing page or here. EME 2019 front page. Please download and post it on your Website, Facebook, Instagram, Twitter etc..
EME 2019 Flyer back side . Please download and post it on your Website, Facebook, Instagram, Twitter etc..
Ab Freitag besteht die Möglichkeit für Händler, ihren Messestand von 16:00 -19:30 Uhr aufzubauen. Regelung bei Clubs, nach Vereinbarung! From Friday onwards, traders will be able to set up their exhibition stand from 16:00-19:30. Club stand setup, by appointment! On Saturday, the stand construction for clubs as well traders begins at 7:30 am. 9:45 clock ends the set-up time. The hall gate (see sketch) is then closed. This also applies to the loading and unloading station. At the loading and unloading area, only large-format vehicles should be permanently parked. All other exhibitors are requested to place their vehicle on the visitors parking lots after unloading. Exceptions are, of course, exhibitors with health handicaps. The clubs and exhibitors are registered at the Hallentor. We would like to ask you, to put on the exhibitors wristband immediatly. This way, we can ensure that no unauthorized persons enter the hall through this entrance during assembly and disassembly. The bracelets should stay in place from registration till the end of the show. We wish you all a good journey and a lot of fun as well as success on the EME 2019! Please keep in mind that swastikas and signs or emblems of former SS-Units may not be shown on models or elsewhere. If those signs are on your models, please cover them with masking tape etc. Please keep in mind that sale at club stands is not permitted, otherwise they will be charged at trader rates! Der Standabbau beginnt mit Veranstaltungsende um 16:00 Uhr! We would like to ask everyone to help taking down all the tables after the end of the show at half past four on sunday. So we can achieve a quick and secure table removal management ;-) Please don´t start taking down your stands before EME 2019 does officially end at 16:00 31st of March!